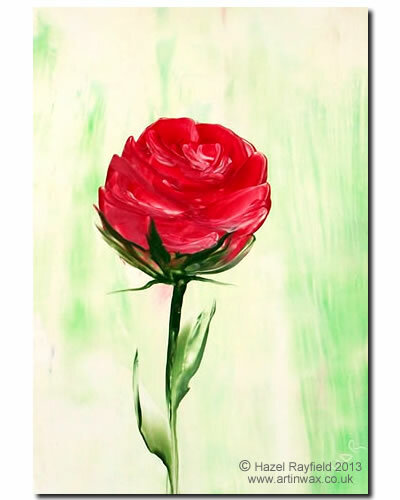 I was recently asked if I would paint a red rose for a collector of Art In Wax and this is the finished painting. This piece is a postcard size, small work of art in encaustic wax on gloss card, backed onto 2mm backing board for structure. All my artwork is unique, no too pieces are identical, although many follow a theme or similar subject due to my passion for painting flowers and landscapes. Lots of paintings on Art In Wax are for sale, so owning some original art can be easy and affordable. Commissioning a piece of art is easy ……. If there is a piece of Art In wax you like but it is sold or not up for sale then I am happy to take on commissions for similar projects. Simple contact me direct using the Art In Wax contact form and we can discuss what you would like me to paint for you. So why not get in touch …….